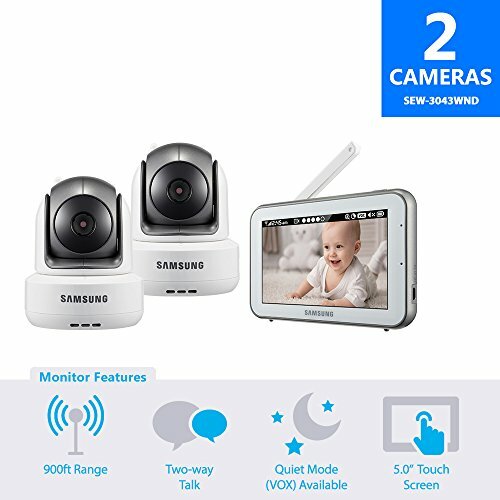 The Samsung BrightVIEW Baby Video Monitoring system uses the latest baby monitoring technology to provide parents of newborns peace of mind and an excellent user experience. The high quality 5.0" Touch Screen on the monitor allows you to observe your little one so you always know what he or she is doing. You can pan and tilt the camera around to your desired position to look at your baby or take a better look at the rest of the room. The monitoring kit can help you put your little one to sleep with 4 pre-programmed lullabies and a soft, comforting night-light. The monitor even lets you set up feeding schedules alerts. The convenient belt clip and built in stand on the unit makes it ultra-portable. Go ahead, keep the monitor on your belt while doing chores around your house or place it on the counter while you are making dinner, and soothe your baby if he stirs in his sleep. Two-Way Talk with Built in Microphone and HD Audio, Non-Visible IR LEDs for Night Vision up to 16 ft.
Long Lasting Monitor Battery, Long range up to 900 ft.